Join Shefqet AvdushEminis mailing list. INTERNATIONAL ARTIST Biography: Shefqet Avdush Emini, an internationally recognized artist. He is an academically educated artist who developed his own style. His own ‘signature’, which made him famous. The list of exhibitions of his artworks in museums and art galleries worldwide is long. Sweden, Denmark, Turkey, Morocco, Egypt, China, Austria, Nederland, Washington D.C.U,Switzerland,Germany, Italy, Grot Britannia, Spain, Portugal, France (Louver) Belgium, Romania, B . . .
FESTANIADA E TITUJVE PEGASIANE (FINAL) 20 ÇMIME 20 SHTETE LIDHJA NDËRKOMBËTARE E POETËVE , SHKRIMTARËVE DHE ARTISTËVE “PEGASI “ ALBANIA THE INTERNATIONAL ASSOCIATION OF POETS, WRITERS AND ARTISTS “PEGASI” ALBANIA PRESIDENCA E LIDHJES NDËRKOMBËTARE E POETËVE SHKRIMTARËVE DHE ARTISTËVE “PEGASI” ALBANIA AKADEMIA ALTERNATIVE PEGASIANE Prot . Nr. 6/79 . . . Biography: Shefqet Avdush Emini, an internationally recognized artist. He is an academically educated artist who developed his own style. His own ‘signature’, which made him famous. The list of exhibitions of his artworks in museums and art galleries worldwide is long. Sweden, Denmark, Turkey, Morocco, Egypt, China, Austria, Nederland, Washington D.C.U,Switzerland,Germany, Italy, Grot Britannia, Spain, Portugal, France (Louver) Belgium, Romania, Bulgaria, Macedonia, Sloven . . .
FITUESIT KREATIVË NGA 45 VENDE TË BOTËS PЁR VITIN 2015 , LNPSHA “PEGASI” ALBANIA , SIPAS PËRKATËSISË Përfundim logjik: “Viti letrar dhe artistik edhe për krijueset e krijuesët, artistët dhe artistet , studiuesit në të gjithë shtrirjen hapësirëgjërë t ë LNPSHA “PEGASI” ALBANIA , ishte një vit plot rezultate , nivel dhe mirëfillësi . Si rrjedhoj&eum . . .
FESTANIADA E TITUJVE PEGASIANE (FINAL) 20 ÇMIME 20 SHTETE FESTANIADA E TITUJVE PEGASIANE (FINAL) 20 ÇMIME 20 SHTETE LIDHJA NDËRKOMBËTARE E POETËVE , SHKRIMTARËVE DHE ARTISTËVE “PEGASI “ ALBANIA THE INTERNATIONAL ASSOCIATION OF POETS, . . .
Review from Patimat Guseynova Sharuhanova artist, Dagestan 21-3-2015 This review is translate with google Is not the creator who is able to give life .... Acrylic painting on cnvas Size: 116 x 200 Year: 2013 Acrylic painting on cnvas Size: 116 x 200 Year: 2013 Strolling through the expanses of the Internet, I came across a magnificent Dutch expressionist Shefqet Avdush Emini. Later, I was for . . .
INTERNATIONAL ARTIST Biography: https://www.shefqetavdushemini.levelofart.com/ http://www.shefqet.exto.nl/ Shefqet Avdush Emini, an internationally recognized artist. He is an academically educated artist who developed his own style. His own ‘signature’, which made him famous. The list of exhibitions of his artworks in museums and art galleries worldwide is long. Sweden, Denmark, Turkey, Morocco, Egypt, China, Austria, Nederland, Washington D.C.U,Switzerland,Germany, . . .
INTERNATIONAL ARTIST Biography: https://www.shefqetavdushemini.levelofart.com/ http://www.shefqet.exto.nl/ Shefqet Avdush Emini, an internationally recognized artist. He is an academically educated artist who developed his own style. His own ‘signature’, which made him famous. The list of exhibitions of his artworks in museums and art galleries worldwide is long. Sweden, Denmark, Turkey, Morocco, Egypt, China, Austria, Nederland, Washington D.C.U,Switzerland . 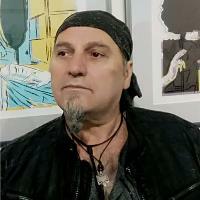 . .
INTERNATIONAL ARTIST Biography: https://www.shefqetavdushemini.levelofart.com/ http://www.shefqet.exto.nl/ Shefqet Avdush Emini, an internationally recognized artist. He is an academically educated artist who developed his own style. His own ‘signature’, which made him famous. The list of exhibitions of his artworks in museums and art galleries worldwide is long. Sweden, Denmark, Turkey, Morocco, Egypt, China, Austria, Nederland, Washington D.C.U,Switzerland,Germany, Italy, . . .